The Holbrook repair project is back on the road. The intersection at Holbrook and Gallagher is now closed off, as workers begin to tear up the street all the way to Conant. 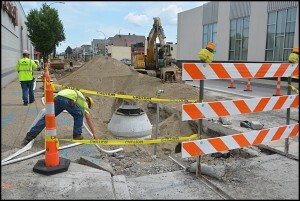 At the same time, new sidewalks will also be installed. The work takes up where the project left off last fall. The first phase started last year at Holbrook and Jos. Campau and stopped at Gallagher. The water lines running under the street are also being replaced. It’s not clear how long it will take to complete this leg of the project. The project was supposed to be completed last year but both union road workers (Operating Engineers Local 324) and the contractors (the Michigan Infrastructure & Transportation Association) went on strike for three weeks last summer. The workers said they had been locked out. Then-Gov. Rick Snyder helped broker a deal to end the labor dispute. Businesses along the road will be open during construction, but obviously it will be a challenge for customers to reach them. The project, costing $1 million, is being funded largely through the federal government – although the city has to kick in 20 percent of the costs out of its yearly street repair fund.